The first microvascular surgery, using a microscope to aid in the repair of blood vessels, was described by Jules Jacobson of the University of Vermont in 1960. The first successful replantation (reattachment of an amputated body part) was reported in 1964 by Harry Bunke. This replantation of a rabbit's ear was significant because blood vessels smaller than 0.04 in (0.1 cm)—similar in size to the blood vessels found in a human hand—were successfully attached. Two years later, the successful replantation of a toe to the hand of a monkey was made possible using microsurgical techniques. 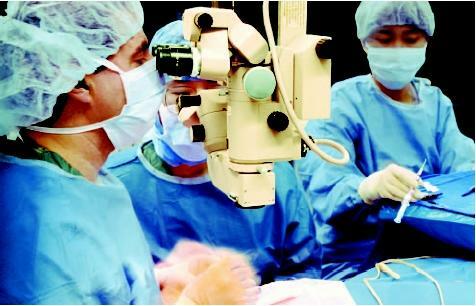 Soon thereafter, microsurgery began being used in a number of clinical settings. place of one lost (for example, a great toe replacing a lost or damaged thumb). Today, microsurgery can be lifesaving. Neurosurgeons can treat vascular abnormalities found in the brain, and cancerous tumors can be removed. Microsurgical equipment magnifies the operating field, provide instrumentation precise enough to maneuver under high magnification, and allow the surgeon to operate on structures barely visible to the human eye. The most important tools used by the microsurgeon are the microscope, microsurgical instruments, and microsuture materials. MICROSCOPE. While operating microscopes may differ according to their specific use, certain features are standard. The microscope may be floor- or ceilingmounted, with a moveable arm that allows the surgeon to manipulate the microscope's position. A view of the surgical site is afforded by a set of lenses and a high-intensity light source. This lighting is enhanced by maintaining a low level of light in the rest of the operating room . Two or more sets of lenses allow a surgeon and an assistant to view the operating field and focus and zoom independently. A video camera allows the rest of the surgical team to view the operating field on a display screen. Features that come on some microscopes include foot and/or mouth switch controls and motorized zoom and focus. A magnification of five to forty times (5–40x) is generally required for microsurgery. A lower magnification may be used to identify and expose structures, while a higher magnification is most often used for microsurgical repair. Alternatively, surgical loupes (magnifying lenses mounted on a pair of eyeglasses) may be used for lower magnifications (2–6x). INSTRUMENTS. Microsurgical instruments differ from conventional instruments in a number of ways. They must be capable of delicately manipulating structures barely visible to the naked eye, but with handles large enough to hold comfortably and securely. They must also take into account the tremor of the surgeon's hand, greatly amplified under magnification. SUTURE MATERIALS. Suturing, or stitching, is done by means of specialized thread and needles. The diameter (gauge) of suture thread ranges in size and depends on the procedure and tissue to be sutured. Conventional suturing usually requires gauges of 2-0 (0.3 mm) to 6-0 (0.07 mm). Conversely, gauges of 9-0 (0.03 mm) to 12-0 (0.001 mm) are generally used for microsurgery. Suture thread may be absorbable (able to be broken down in the body after a definite amount of time) or non-absorbable (retaining its strength indefinitely), natural (made of silk, gut, linen, or other natural material) or synthetic (made of nylon, polyester, wire, or other man-made material). The type of suture thread used depends on the procedure and tissue to be sutured. The suture needle comes in various sizes (diameters and length) and shapes (straight or curved), and also with different point types (rounded, cutting, or blunt). It comes with suture thread preattached to one end; this is called the swage. As in the case of suture thread, the type of needle used depends on the procedure and tissue to be sutured; generally, needles with a diameter of less than 0.15 mm are used for microsurgery. For a surgeon to perform microsurgery in a clinical setting, extensive training and practice are required. A basic knowledge of anatomy and surgical techniques is essential. After a thorough introduction to the operating microscope and other microsurgical equipment, basic techniques are introduced using small animals as the experimental model. Specifically, surgeons must be taught how to maintain correct posture and to maintain constant visual contact with the microscope during surgery, how to properly hold and use the instruments, how to minimize the amount of hand tremor, and how to perform basic techniques, such as suturing. After becoming proficient at these skills, more advanced techniques can be taught, including procedures regarding how to treat specific conditions. Extensive and ongoing practice is necessary for a surgeon to maintain adequate proficiency at microsurgical techniques. For this reason, a microsurgical laboratory is made available to surgeons for training and practice. Most microsurgical procedures utilize a set of basic techniques that must be mastered by the surgeon. These include blood vessel repair, vein grafting, and nerve repair and grafting. BLOOD VESSEL REPAIR. Blood vessel, or vascular anastomosis, is the connection of two cut or separate blood vessels to form a continuous channel. Anastomoses may be end-to-end (between two cut ends of a blood vessel) or end-to-side (a connection of one cut end of a blood vessel to the wall of another vessel). The first step of creating an anastomosis is to identify and expose the blood vessel by isolating it from surrounding tissues. Each end of the vessel is irrigated (washed) and secured with clamps for the duration of the procedure. A piece of contrast material is placed behind the surgical site so that the tiny vessel can be more easily visualized. The magnification is then increased for the next segment of surgery. The first suture is placed through the full thickness of the vessel wall; the second and third sutures are then placed at 120° from the first. Subsequent sutures are placed evenly in the remaining spaces. Arteries 1 millimeter in diameter generally require between five and eight stitches around the perimeter, and veins of the same size between seven and 10. Once the last suture has been placed, the clamps are released and blood is allowed to flow through the anastomosis. If excessive bleeding occurs between the stitches, the vessel is reclamped and additional sutures are placed. The procedure for an end-to-side anastomosis is similar, except that an oval-shaped hole is cut in the wall of the recipient vessel. Sutures are first placed at each of the oval to connect the attaching vessel to the recipient vessel, and then placed evenly to fill in the remaining spaces. VEIN GRAFTING. Vein grafting is an alternative procedure to end-to-end anastomosis and may be pursued if cut ends of a blood vessel cannot be attached without tension. Nonessential veins similar in diameter to the recipient blood vessel can be removed from the hand, arm, or foot. If the graft is to be used to reconstruct an artery, its direction is reversed so that the venous valves do not interfere with blood flow. End-to-end anastomosis is then performed on each end of the graft, using the suture techniques described above. NERVE REPAIR. The process of connecting two cut ends of a nerve is called neurorrhaphy, or nerve anastomosis. Peripheral nerves are composed of bunches of nerve fibers called fascicles that are enclosed by a layer called the perineurium; the epineurium is the outer layer of the nerve that encases the fascicles. Nerve repair may involve suturing of the epineurium only, the perineurium only, or through both layers. Many of the techniques used for blood vessel anastomoses are also used for nerves. The cut ends of the nerve are exposed, then isolated from surrounding tissues. The ends are trimmed so that healthy nerve tissue is exposed, and a piece of contrast material placed behind the nerve for better visualization. Each nerve end is examined to determine the pattern of fascicles; the nerve ends are then rotated so that the fascicle patterns align. Sutures may be placed around the circumference of the epineurium; this is called epineurial neurorrhaphy. The perineurium of each cut fascicle end may be stitched with excess epineurium removed (perineurial neurorrhaphy), or both layers may be sutured (epiperineurial neurorrhaphy). NERVE GRAFTING. If there is a large gap between the cut ends of a nerve, neurorrhaphy cannot be performed without creating tension in the nerve that can interfere with postsurgical function. A piece of nerve from another part of body may be used to create a nerve graft that is stitched into place using anastomosis techniques. A disadvantage to nerve grafting is that a loss of function or sensation is experienced from the donor nerve site. A common nerve used for grafting is the sural nerve, which innervates parts of the lower leg. In an emergency situation, such as an amputation or crushing injury, a number of steps must be taken immediately to improve the odds that replantation or reconstruction will be successful. An IV line is placed so that fluids and antibiotics can be administered. The injured area is x rayed so that the extent of the injury can be determined, and the amputated body part is wrapped in sterile gauze and placed on ice, so that the tissues are preserved. To prevent freezing, the body part must not be packed below the ice. The patient is transported by ambulance or helicopter to the nearest surgical center capable of microsurgical repair. In other cases, a patient may suffer from a chronic condition or wound, and microsurgery can be scheduled as an elective procedure. Prior to surgery, the patient will be instructed to refrain from tobacco use because it interferes with healing. In addition, the patient will be told not to eat after midnight the day of surgery. It is important that the patient inform the doctor completely about any prior surgeries, medical conditions, or medications taken on a regular basis, including nonsteroidal anti-inflammatory drugs (NSAIDs), such as aspirin . Patients taking blood thinners, such as Coumadin or Heparin (generic name: warfarin), should not adjust their medication themselves, but should speak with their prescribing doctors regarding their upcoming surgery). Patients should never adjust dosage without their doctors' approval. This is especially important for elderly patients, asthmatics, those with hypertension, or those who are on ACE inhibitors. The patient will be placed under general anesthesia for the duration of the procedure. The advantages to general anesthesia are that the patient remains unconscious and completely relaxed during the procedure, imperative because of the precise nature and extended duration of the surgery. The patient must be able to tolerate the long surgery and therefore must be relatively stable condition; complex surgeries may take up to 12 hours or more. Replantation. This emergency surgery is performed to reattach an amputated body part such as a finger, arm, or foot. Replantation surgery requires a series of time- and energy-intensive steps to reattach all of the structures while the amputated part is still viable. The cut bone must be shortened slightly so that blood vessels and nerves can be reattached without tension. Anastomoses are created between cut arteries and veins and blood flow is reestablished to the amputated part. Tendons (if present) are then repaired, followed by nerves and soft tissues. Further procedures may be necessary to completely the reconstruction depending on the extent of the injury. Transplantation. In some cases an amputated part cannot be reattached, or tissue is deformed because of a congenital defect or an injury. Transplantation may then be an option. The great toe or second toe may be removed from a patient's foot and transplanted to the hand to replace a missing finger. A segment of rib along with its blood supply can be used to reconstruct bones in the face and jaw. Free-tissue transfers. Also called free flaps, free-tissue transfers may be used to reconstruct damaged tissues that cannot be treated with skin grafts, closed by traditional methods such as suturing, or allowed to heal without intervention. This includes tissues that have constricted after a burn, injuries in which there is not sufficient skin to properly close the wound, or tissues that have been removed as a result of treatment for cancer. Examples of tissues that may be transferred with microsurgical techniques are skin, muscle, fat, bone, and intestine. Following surgery, the patient is given intravenous fluids and usually progresses to a liquid diet within 12 to 24 hours, and a regular diet soon thereafter. The patient must be kept warm and adequately hydrated, and the surgical site is elevated if possible to help drain excess fluids. Medications are administered to help manage pain. The color, temperature, quality of capillary refill, and tissue turgor (fullness) of the surgical site are closely monitored. Skin should be pink, warm, and have one- to two-second capillary refill. Conversely, tissue that is pale or blue, cool, with no refill or rapid refill may indicate a problem with blood flow. Doppler ultrasound. This technology uses high-frequency sound waves to evaluate the flow of blood to and from the surgical site. Intravenous fluorescein. After a chemical dye called fluorescein is administered to the patient, a specialized machine called a fluorimeter is used to determine how much blood is flowing through the surgical site. Pulse oximetry. A pulse oximeter measures the amount of oxygen in the blood and tracks the patient's pulse. Arteriography. X rays are taken of the surgical site after a contrast dye has been injected into the bloodstream to determine the condition of vascular anastomoses. When the patient is discharged from the hospital, he or she will receive instructions for aftercare. Exposure to tobacco must be limited for at least six weeks following the surgery, as nicotine interferes with circulation. The patient must remain warm as body temperature also affects circulation. Bed rest may be prescribed for a period of days to weeks after surgery, depending on the procedure. Patients who have had a hand, finger, or multiple fingers replanted must keep the part elevated at heart level to help blood flow and decrease swelling. Some form of rehabilitation is often recommended after microsurgery. This includes a program of individualized exercises used to restore function to a replanted or transplanted body part. In some cases where problems with circulation occur after surgery, leech therapy may be recommended. Leeches are worms that attach to the skin and draw blood while also injecting substances into the skin that act as a local anesthetic and an anticoagulant (preventing the formation of blood clots). Therapy involves attaching a leech to the replanted part or tissue flap and allow it to feed for 15 to 30 minutes, several times a day, until blood flow is established. Jobe, Mark T. "Microsurgery" (Chapter 60). In Campbell's Operative Orthopedics, 10th ed. Philadelphia: Mosby, Inc., 2003. American Society for Reconstructive Microsurgery. 20 North Michigan Ave., Suite 700, Chicago, IL 60602. (312) 456-9579. http://www.microsurg.org . Buncke, Harry J. Microsurgery: Transplantation-Replantation. 2002 [cited April 25, 2003]. http://buncke.org/book/contents.html . Chang, James. "Principles of Microsurgery." eMedicine. August 5, 2002 [cited April 25, 2003]. http://www.emedicine.com/plastic/topic262.htm . "Microsurgery." California Pacific Medical Center. [cited April 25, 2003]. http://www.cpmc.org/advanced/microsurg/ . "Online Atlas of Microsurgery." Microsurgeon.org. March 20, 2003 [cited April 25, 2003]. http://www.microsurgeon.org . I lost 3 of my fingers and now I am going to have the toe to hand tansplant is Sep. I am looking for some good details but they are not usually free. Can you help me with that? uhm just one question how do you relate this to biology ? I am in need of an inner ear transplant. a cochlea.we have micro surgery today and beam path laser now.in 1984 an eardrum and 3 bones and an cochlea was performed by dr.luis r. it is on yahoo.com.this was groundbreaking by dr.luis r.he is now retired.mine is so bad it moves around in cochlea and my ear turns red.please send this to your ent otologists and surgeons.you can contact dr.amitha parvateeni at detroit dingell va medical center.i have studies the charts and books on inner ear.there is no reason that it cant be done.i suffer with it for 10 years.here you have a patient before you.they need a live patient to do this. I wish to add since the 1980s microsurgical and robotic surgery techniques have advanced with laser and beam path.i am a veteran at john dingell vamc hospital in detroit michigan.i have a cochlea insult in medical terms.i did not get diagnosed correctly with my ear infection viral labyrintitus.all the drs. i had thought it was acute otitis media.it turns my outer ear red everyday and i have a chunk moving around in my inner ear cochlea.if you are a ent surgeon or an otologist or a neurosurgeon specializing in the head and neck from a major university in the usa and welcome challenges such as this please contact the dept.of otolaryngology john dingell vamc hospital detroit michigan. I just went through microsurgery which placed stints near the arteries in my leg. This is the second time on that same leg. I would like to know if I should have experienced any pain (which was extensive) during this surgery.